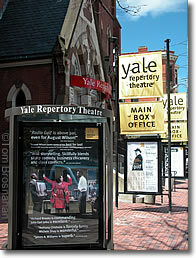 The Yale Rep, located in a former church building on Chapel Street, corner of York, two blocks west of New Haven Green, has a full program of performances when the university is in session, from October through May. It's a professional theater company specializing in new plays by both emerging and established playwrights —100+ premieres have been held here—and "bold interpretations of classics that make immediate connections to contemporary audiences." Several of its premieres have received Pulitzer prizes and Tony awards (and even more nominations), and an even greater number have gone on to open on Broadway. Could this possibly be...the Yale Rep?